Drops of sweat trickle down your forehead and your heart starts beating faster as you look down at a 10,000ft freefall. "I can do this," you mutter under your breath because a parachute is the only thing that stands between life and death at the moment. Finally, eyes closed, you take the leap. The GoPro Hero range of action cameras has been capturing such experiences of adrenaline pumping adventure sports since 2004. The first GoPro Hero shot only still photographs on 35mm film. It wouldn't be far-fetched to say that GoPro created the action camera category, spurring other manufacturers to try their own versions. The GoPro Hero has come a long way since then; the company even won an Emmy award in 2013 for Best Technology and Engineering. After multiple iterations, today we have the GoPro Hero4 Black, which can shoot full-frame 4K footage at a decent 30fps. Even a mainstream camera manufacturer such as Nikon only started supporting 4K video capture recently with its Nikon 1 J5 mirrorless camera. Anyway, this is quite an achievement for a camera of this size. While we couldn't really take our review unit rafting or skydiving, we did mount it on a motorbike and take it out for a spin. Why should adventure sports junkies have all the fun? For the purpose they serve, GoPro Hero cameras are meant to be tiny and inconspicuous. For that reason the company hasn't played around with the core design and the ergonomics too much. Without the bundled housing, the Hero4 Black and Hero 3+ (the previous version), including their variants, have the same dimensions of 41x59x30mm. The only difference between the Hero4 Black and the Hero4 Silver is the inclusion of an LCD touchscreen on the rear of the latter. 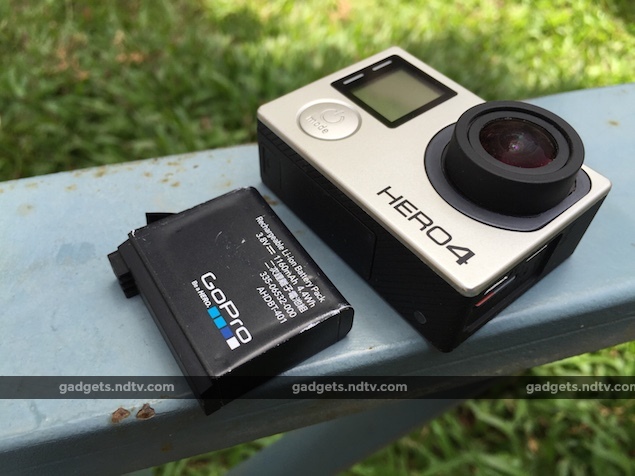 However,the Hero4 Black is the superior of the two in terms of video recording capabilities. Without its waterproof case, the camera weighs exactly 88g and with it, that goes up to 152g. The housing is essential if you are going to mount the camera on different surfaces using the official accessories. 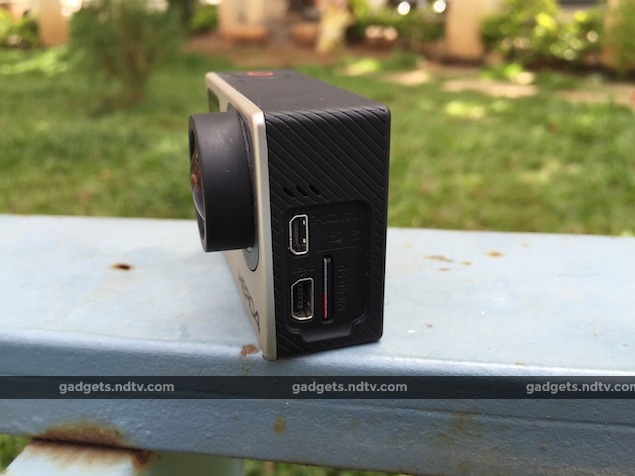 The Hero4 Black's lens peeks out from the front of the unit and there's a small LCD to its left. Two LED indicators are lined up next to the LCD - the one on top blinks blue to indicate the Wi-Fi status, whereas the bottom one is for camera status and doubles up as the battery indicator. 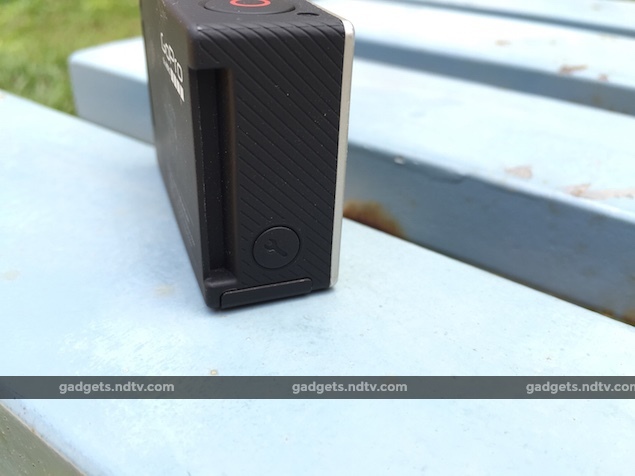 Below the LCD is a button that can power up the Hero4 Black and change modes. A big shutter button lies on top of the camera along with another camera status light. The left edge has a settings button, which has replaced the Wi-Fi button which was on the Hero3+. This is great because it makes the software a bit more accessible. More on that later. On the rear, there is yet another camera status light (which might feel like overkill but makes sense given the various ways this device can be mounted). 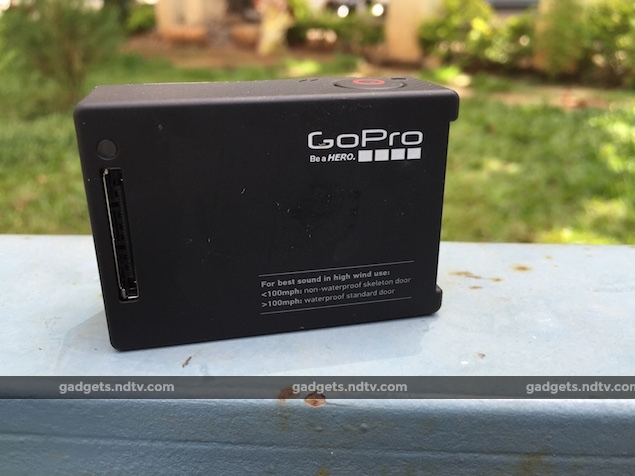 GoPro's proprietary "Hero port" on the rear is used by accessories such as the external LCD monitor and LCD Touch BacPac. The right edge of the Hero4 Black houses the Micro-HDMI port (cable sold separately), Micro-USB port, and microSD card slot. There is a speaker on on the right as well. At the bottom is a battery door that slides open. A small slip of paper attached to the battery can be used to pull it out. We must mention that we haven't seen as many official first-party accessories for any other product. For example, there are at least eight options for mounts. The GoPro Hero4 Black has a 12-megapixel 1/2.3-inch CMOS sensor and an F2.8 aperture ultra-wide angle lens. This specification is unchanged from the Hero3+ Black. However, the main difference between the two variants of the GoPro Hero4 - Black and Silver - is the quality of videos each can take. The Hero4 Black can capture 4K (3840x2160)footage at a decent 30fps whereas on the Hero4 Silver it is capped at 15fps. Similarly, the Hero4 Black can shoot 1080p video atup to 120fps and 720p footage at 240fps - which is what the iPhone 6 (Review | Pictures) and iPhone 6 Plus (Review | Pictures) can achieve. 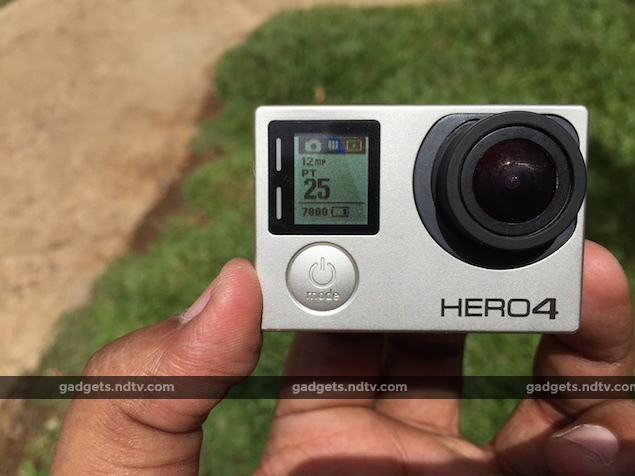 The GoPro Hero4 Black also has a new image processing engine which the company claims is twice as powerful. The ability to record video at a rich 60mbps bitrate will be very tempting to professional videographers, because the quality of recordings is bound to be excellent, and it also allows for downsampling later in post-processing. The GoPro Hero4 Black continues to rock a mono microphone for recording audio and apparently the quality has been improveddrastically. However, there is also an optional 3.5mm input accessory which can be used to attach a better external mic. GoPro goes one step further and adds an integrated analog-to-digital converter thus enabling users to add microphones with lower sensitivity response for better recording quality. Let's not forget that the Hero4 Black can also capture 12-megapixel still shots and has a Time Lapse mode that allows users to capture a series of photos at intervals of 0.5 to 60 seconds. There is a similar Time Lapse mode for video (only at 4K and 2.7K). Additionally, using the Video+Photo mode a user can record video and capture Time Lapse photos at the same time. In Night Photo mode one can capture a single stills at exposure times of up to 30 seconds. An interesting Superview video mode on the GoPro Hero4 Black (available in 4K, 1080p and 720p resolutions) can be used to capture videos with a more immersive wide-angle perspective. GoPro has enhanced the capabilities of its Protune software to now accommodate both videos and stills. Protune opens up a bunch of options for more control over the capture quality. For example, a user can choose a flat colour profile for better accuracy so that it can be manipulated later at the editing desk. Similarly, Protune allows users to change the ISO settings, white balance, sharpness and exposure. 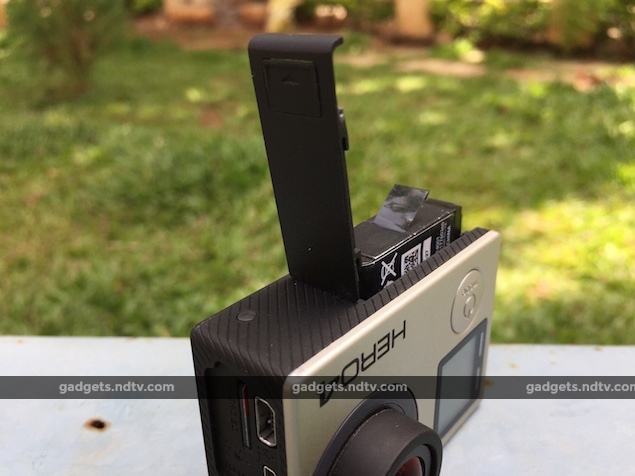 The GoPro Hero Black incorporates Bluetooth in addition to the already existing Wi-Fi for connectivity. The Hero4 Black accepts microSD cards of up to 64GB in capacity, but you will need a card with fast writing speeds - GoPro suggests at least Class 10. For some reason, the device has a slightly smaller 1160mAh battery than its predecessors did. 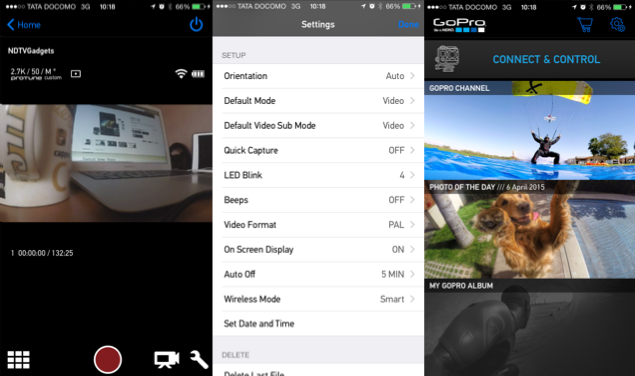 Thanks the the new Settings button, navigating through the software of the GoPro Hero4 Black is much easier. Hitting the Mode button switches through all the available modes. On the other hand, the Settings button can be pressed to access the settings available for the specific mode that the camera is currently in. One can also access a separate settings menu, with all the options consolidated together, by switching through the modes. Apps for Android and iOS let you connect your smartphone to the camera and use it as a viewfinder or review captured files. 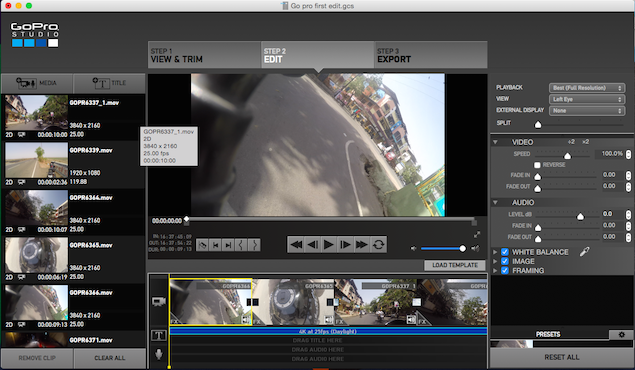 Similarly, there is a free GoPro Studio program for Windows and OS X, which we found to be user friendly. It is great formaking basic edits. For testing, we first attached the camera to a selfie stick without its housing. The selfie stick was then mounted on a motorbike. We chose this method so that we could test the full range of the mono microphone. Our experiment, and the corresponding experience is proof enough that if you are even slightly enterprising then the GoPro Hero4 Black could be used to capture great action footage with DIY hacks. That said, one can use the official helmet mount or handlebar mount as well. We captured a lot of 4K footage at 25fps. The first thing we noticed was that the camera gets hot - not to the extent that it feels uncomfortable, but perceptibly hot nonetheless. Moreover, if you are going to use a phone as a viewfinder, rest assured that the battery life will drain faster than Usain Bolt on steroids. Our battery lost all its juice in just a little over 45 minutes of continuous 4K video recording when connected to a phone. The situation does get better with Wi-Fi turned off, but even otherwise we strongly suggest that users who want to shoot long action sequences buy an extra battery. Without a doubt, the quality of captured video was really good and the camera managed to capture a lot of detail. The colours captured using the default colour profile were adequately saturated. Having said that, we'd suggest using Protune and shooting with a flat colour profile, which might look lifeless at first, but will allow for more control over the final image. We played around with GoPro Studio and edited some footage to make it look like a neo-noir film. The mono microphone can capture crisp audio but we noticed that going above 50kmph introduces a lot of environmental noise. Using a higher quality external microphone can alleviate this problem. One thing we did notice after shooting multiple test videos are that god rays are unavoidable in bright sunlight; in fact, it would even make J.J. Abrams proud. There is no HDR mode for better dynamic range, which would have been great since we noticed a lot of areas which were over-exposed in the background. However, this can be fixed during editing. Objects that got close to the lens during capture would often go out of focus. Moreover, there is evident barrel distortion especially if shot with a wide field of view, which is what most users will want. This might be slightly off-putting for a few people but the resulting style has become one of the USPs of the GoPro range. We captured 1080p at 120fps and 720p at 240fps to test the slow motion features and found that the captured video was really smooth, and the camera didn't lose any fidelity either. The sample videos embedded here have lost some fidelity due to compression while uploading, but are still fairly indicative of the results one can achieve. Low-light videos were significantly better than previous models have been able to achieve thanks to the bumped up resolution, but it could have been even better. We noticed a lot of noise, and bloom is significantly more annoying here. 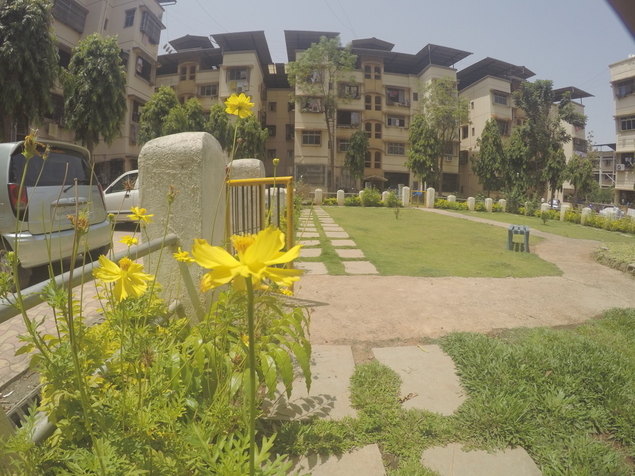 The GoPro Hero4 Black may be a whiz at video capture but its still photo capabilities are decent at best. Apart from close-to-accurate colours, the details were lacking. There is no doubt that the GoPro Hero4 Black is the best action camera money can buy right now, thanks to its superior 4K 30fps video recording capabilities, great performance, and compact yet sturdy body. That said, the battery life is a big letdown, and combined with the heating issues, this essentially means that the GoPro Hero4 Black is more suited for 1080p video capture. Stereovision, the official distributer for all variants of the GoPro Hero range of cameras in India, sells the Hero4 Black for Rs. 43,900 which is pretty steep compared to the price of the Hero4 Silver, which is a more affordable Rs. 34,900. If you don't absolutely need a future-proof device and can survive with 1080p or 2.7K resolution video, we'd suggest picking up the Hero4 Silver instead. The savings can be used to buy accessories of your choice. Sony's recently launched Action Cam FDR-X1000V is probably the only other mainstream action camera with the ability to shoot 4K video, but it isn't available in India yet. That makes the GoPro series your best bet at the moment.